Serial (RS232/RS485)/USB to DALI gateway module. 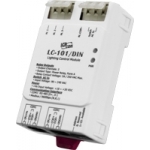 Supports DCON or Modbus RTU protocol. 1-channel AC digital Input with Relay Output Lighting Control Unit Modbus RTU/DCON protocol.